There are 4 charm packs left over from the Kona Charm Pack Challenge and CMQG is planning to use them to create 2 charity quilts for the Japan Earthquake/Tsunami Relief Effort. Two Quilts: Each quilt will consist of (16) 12.5" square Wonky Star Blocks. 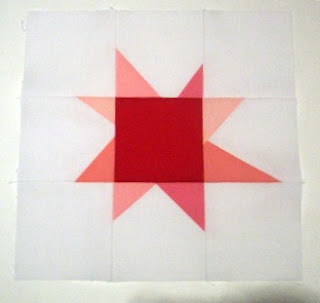 The star in the block will be made from Kona Charms and the background will be Kona White. Each quilt will be approximately 50" x 50". Each block will use 5 charms (cut into 4.5" squares) and 8 - 4.5" squares of Kona White. Baggies will be passed out at the next meeting for those who are willing to make a block (or two). KONA WHITE DONATIONS: To complete this charity project, we are in need of 4 to 4.5" yards of Kona White. Keep in mind at Kona White is available at Joann's in stock for $6.99 per yard. You can use your 40% coupons to get it for about $4.20 per yard. If we have just a few people who are willing to donate half to one yard, we can easily make this project a success! Please let me know if you are willing to donate unwashed Kona White for use in this project. I will donate a couple of yards! I will also get a couple of yards of Kona white.